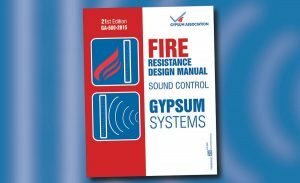 The Gypsum Association (GA) released the 21st edition of the Fire Resistance Design Manual (GA-600-2015). Revised on a three year basis, GA-600 has been referenced by the model building codes as a source of fire resistive designs for more than 40 years. Now 306 pages, the 2015 edition contains nearly 100 new systems that supplement existing assemblies for walls and partitions, floor-ceiling systems, area separation walls and many others. Among these, are 20 new head-of-wall and base-of-wall systems that significantly expand the options for perimeter relief. A much more interactive digital version of the Fire Resistance Design Manual (FRDM) is available with the 2015 edition. More like an e-reader than previous PDF versions, the new digital Manual is searchable, easy to navigate, delivered on demand, and allows users to print specific pages for reference. The FRDM is currently referenced by the International Building Code, and The National Fire Codes, as well as many state and local jurisdictions in the US and Canada as a source document for fire-resistance and sound-control rated designs that incorporate gypsum board in a variety of building systems. Visit the Gypsum Association Bookstore to purchase a hardcopy or e-reader/hardcopy combination.